_A strong sharp knife is an essential tool out in the woods or mountains, and a six to eight inch camp knife is perfect for all around use - from breakfast and camp chores to cleaning game. 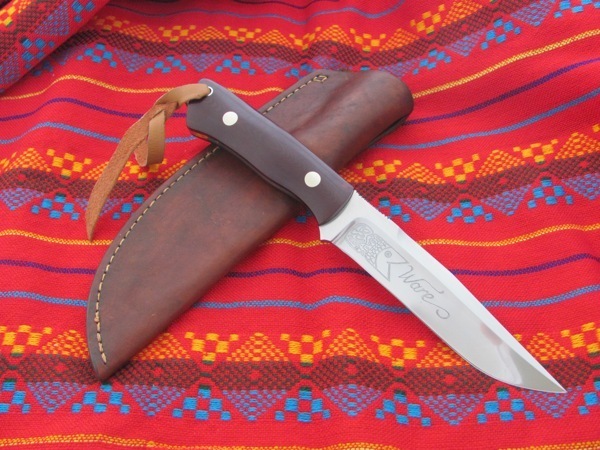 Camp knives are crafted from 3/16" or 1/4" 440C stainless or O1 carbon tool steel. The blades have a shallow hollow grind with a convex grind down to the edge for maximum strength. Carbon steel blades are selectively hardened. The top clip is not sharpened, but thins the point sufficiently without giving up strength. The tang is left full thickness for maximum strength, but is drilled out to loose maintain balance. The blade has a buffed satin Field Finish. I can checker or file a thumb rest. Each knife comes with a heavy, wet molded, leather pouch sheath, finished with beeswax and oil. I can etch a name or design on the blade, whether it's for you, or for a gift. 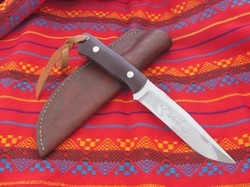 Please see the "Available Knives" pages for photos and descriptions of Hunting / Camp knives in stock.